It used to be that the television was the centre piece of your living room. An influx of smaller screens in the home, though, has meant that the TV has had to fight a lot harder in recent years for your attention. One way it has done this is with new technology. 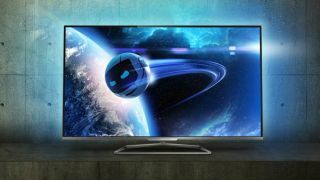 While 3D fell by the wayside, due to gimmickry, smart TV functionality has finally started to shine through and then there is 4K - a technology that has quickly changed from an out-of-reach luxury to a near affordable one. The biggest change arguably though is web connectivity. The internet has transformed into the most powerful tool for the broadcast industry. Whether it is the like of Netflix streaming its wares, smart TVs taking advantage of the internet to bolster their features or app manufacturers tuning into the needs to TV watchers, the web is where the future of television resides. To understand more about this, TechRadar asked Anthony Rose his thoughts of where he felt things are going for television. Rose was an integral part in the creation of the BBC iPlayer, the flagship on-demand platform that showcased the power the web has on television and vice versa. He is now the CTO of TV social network Beamly, formally Zeebox. Here are Rose's thoughts on what the future of television looks like - as well as the features he feels just won't make the cut. "Smart TVs in the past have been made by television manufacturers who haven't really looked to change the model greatly. For example, you are not going to change your TV just so you can get another application - you won't carry it to the dump if you can't get Netflix on it. You would rather spend £30 on a box to plug into the TV." "Smart TVs haven't reached a tipping point where consumers know they are connected to Wi-Fi. But these new devices, like Chromecast, are easy to use and will prove to be the tipping point. Chromecast in this iteration isn't quite there yet but what is interesting is the idea of Android TV - that could change TV." "Today you have got the television that plays as it always did but you also have these smart tech guys trying to come up with relevant second screen apps. What you really want to do is take that second screen output and put it back on to the TV. We at Beamly are working with companies that make on-screen overlays to make this happen. So you could interact with a poll on the phone, then this interaction goes back on to the TV." "Broadcasters at the start of the second screen push decided to make an app for each show. In the US they call this the app graveyard. Some of major broadcasters have over 200 apps that are simply not supported as the shows aren't on all the time, only an hour a week for say 13 weeks. It just didn't work." "One of the things with binge watching is spoilers. House of Cards has been seen by some as the most anti-social show ever because everyone is on a different episode and you can never talk about it. When House of Cards season 3 comes out we will tap into the show, and have a community and whichever episode you are on you can join that community." "The first and second screen will be a short period in TV history. The reality is the video will play on any convenient screen. In bed it may be your tablet and at home in your living room this will jump to your television. It is really any screen. But the place where you interact, unless your TV is a touchscreen, is your mobile." "We have been pushing more recommendations in Beamly. People are looking for a few things: a new class of content of shows to follow and what to watch on TV right now. Recommendations are super important. What we have got on the Beamly app is My TV week. It is Channel Me. We will correct the TV schedule for you and soft recommend anything." "The problem with recommendations is that they aren't always right. If you look to your partner at home, they know you well but even then it is impossible to give a right recommendation. So, we have put in the ability to dismiss a recommendation. If they aren't right then just dismiss it. It turns the whole thing into a game - getting rid of the ones that you don't like and keeping the ones that you do like. It trains the app." "Everyone is challenged with the current desire and future aspirations which is active participation with television shows. Because of this, second screen apps are slightly ahead of the curve and television hasn't changed as fast as the app makers are innovating. I see this in ourselves where we have dialled down some of our app. "We always wanted to be the social network for TV but when we got started we were faced with broadcast television. This has changed: we are calling this second screen 2.0. There is no doubt in anyone's mind that we will be watching television in a vastly different way in 5-10 years. Viewings will be where and when we want on any device and we will be speaking to our friends and go back into the show and we have to resonate that - and offer what people want." Social showdown: Can Beamly beat Facebook and Twitter to TV?